Originally published in Journal of Creation 13, no 2 (November 1999): 96-100. Often in the history of evolutionary theory, early preliminary reports of new fossil finds are over-optimistic. Figure 2. Typical of australopithecines is the occipital flaring visible in the posterior view of Skull 14705. Figure 3. A more up-to-date lateral view of 1470 by Pellegrino. Brow ridges are clearly evident, and the face is more prognathous3. In 1985, the primatologist Napier, reproduced a more up-to-date anterolateral photograph of 1470, which clearly indicated a more robust specimen, especially in the forward jutting of the face. 8 Napier ascribed an ECV of 750 cm3 to the skull. In 1995, Howells pointed out that some experts, such as Wood, were no longer consigning 1470 to the taxon Homo habilis but rather to a separate species, Homo rudolfensis.9 Wood had elucidated this view in 1993. 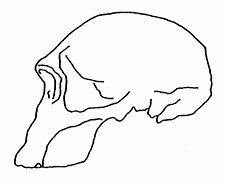 10 In 1995, Leakey himself produced another reconstruction of the skull, which was quite similar to that of Pellegrino.11 This time he consigned 1470 to the taxon Homo habilis (Figure 4). Figure 4. In this 1995 reconstruction, the discoverer himself has apparently acknowledged that the original reconstruction was not accurate11. Figure 5. This may be the true profile of 1470. Based on new bone-scanning techniques, typical australopithecine prognathicity is evident in this 1992 drawing12. Bromage and Dean soon found other evidence pointing in the same direction. By studying growth lines in tooth enamel in other fossil hominids, they found the teeth of many early specimens developed at ape-like rates. This was confirmed later by a second team (Conroy and Vannier). 14 The results came as quite a shock, and ran contrary to prevailing views on hominid maturation. There is no compelling evidence to contradict the common creationist view that [they] all belong to one created kind. Although overall ape and human brain structure is somewhat similar, there are two areas, which may help to distinguish between fossil apes and humans—the two major language centres (the Broca’s area and Wernicke’s area) and the lunate sulcus, which is found in humans but not in apes. 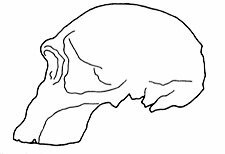 These features sometimes leave faint traces inside the skull, and claims have been made that a Broca’s area is discernible in Skull 1470. However, as Leakey says,20 the issue is by no means clear, and the experts are divided. The material is extremely difficult to interpret because the markings on the brain casts are very faint. Like humans, chimps and gorillas are vocal, using lips, tongue, and vocal cords when communicating, and they too have a Broca’s area.21 However, it is the smaller, less detectable Wernicke’s area, which is necessary for full speech. A Broca’s area exists in the erectus specimen WT 15000,22 but has not been detected in any other H. erectus specimen as geologically old as the Turkana Boy. This aspect must, therefore, be left in the ‘extremely doubtful’ category. Certainly no evidence exists for the presence of the lunate sulcus or Wernicke’s area in ER 1470. Figure 6. Comparative lateral profiles of the ‘Taung Child,’ (a specimen of A. africanus), and a juvenile chimpanzee. The similarities are clear. By the time the chimp has reached adulthood the resemblances are much less obvious24. Comparative lateral skull profiles of the Taung ‘Child’ and juvenile chimps bear an uncanny likeness to each other, while the latest profiles of East Turkana habilines such as ER 1470 and KNM–ER 1813 appear to reflect an increasing simian appearance, accompanied by morphological shrinkage.26 Comparisons of KNM–ER 1813 and the skull of a pygmy chimpanzee are instructive. 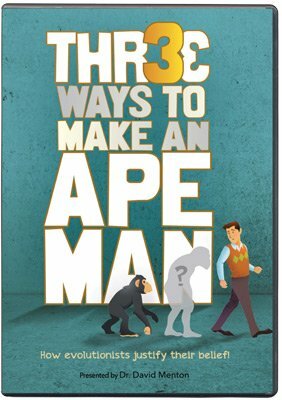 27 These interpretations are compatible with the remarkable lack of chimp and gorilla forms in the fossil record. It strongly supports Pliocene and Pleistocene australopithecines being ancestral not to humans but to modern African pongids. Strong nuchal cresting28 is present in ER 1470, ER1805, and to a lesser extent in ER 1813. It is interesting to note that the development of saggital crests in living chimpanzees is not altogether common, and is generally restricted to males of the species. Indeed, saggital crests are not particularly diagnostic, since they can be found in some Inuit (Eskimo) males. A.W. (Bill) Mehlert has a Diploma in Theology and lives in Brisbane, Australia. He is a keen student of flood geology and the fossil record, including the supposed fossil evidence for human evolution, and has written a number of important articles on these topics in the Creation Research Society Quarterly and TJ. Return to top. Wood, B., The Evolution of Early Man, Cassells, Australia, Sydney, pp. 75, 78, 1976. Johnson, J.W., The Crumbling Theory of Evolution, Perpetual Eucharistic Adoration Inc., Los Angeles, pp. 45–52, 1982. Pellegrino, C.R., Timegate: Hurtling Backward Through History, TAB Books, Blue Ridge Summit, Virginia, p. 120, 1985. Hummer, C., A plea for caution about Skull 1470, CRSQ 14:168–172, 1977. Howells, W., Getting Here: The Story of Human Evolution, The Compass Press, Washington DC, p. 89, 1993. Lewin, R., Bones of Contention, Penguin, London, pp. 160–161, 1987. Pellegrino, Ref. 3, p. 134. Napier, J.R. and P.H., The Natural History of the Primates, Cambridge University Press, Cambridge, United Kingdom, p. 181, 1985. Howells, Ref. 5, p. 89. Wood, B., Rift on the record, Nature 365:789, 1993. Leakey, R., The Origin of Humankind, Weidenfeld and Nicolson, London, p. 28, 1995. Bromage, T., Faces from the past, New Scientist 133(1803):32–35, 1992. Bromage, Ref. 12, p. 32. Conroy, G.C., and Vannier, M.W., Dental development of the Taung skull for computerized tomography, Nature 329:625–627, 1987. Bromage, Ref. 12, pp. 33, 35. Leakey, M.G., and Leakey, R.E., Koobi Fora Research Project 1: The fossil hominids and an introduction to their context, 1968–1974, Clarendon Press, Oxford, p. 130, Plate 15, 1978. Bromage, Ref. 12, p. 33. Haviland, W.A., Human Evolution and Prehistory, Holt, Rinehart and Winston, New York, p. 139, Figure 7.2, 1978. Walker, A., Leakey, R.E., Harris, J.M. and Brown, F.H., 2.5-Myr Australopithecus boisei from west of Lake Turkana, Kenya, Nature 322:517–522, 1986. Leakey, R. and Lewin, R., Origins Reconsidered, Little, Brown and Co., London, p. 260, 1993. Willis, D., The Hominid Gang, Phoenix Books, New York City, p. 241, 1992. Walker, A. and Shipman, P., The Wisdom of Bones, Weidenfeld and Nicolson, London, pp. 172–173, 1996. Leakey, Ref. 11, p. 131. Beasley, G.J., Pre-Flood giantism: a key to the interpretation of fossil hominids and hominoids, TJ 4:5–55, 1990. 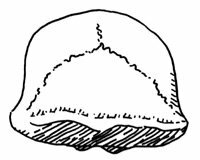 Beasley, G.J., Archaic fossil human remains—an update, TJ 9(2):169–215, 1995. Beasley, Ref. 24, p. 43. A nuchal crest is a transverse body ridge across the posterior margin of the root of the skull for attachment of neck muscles. Johanson, D.C. and Edgar, B., From Lucy to Language, Simon and Schuster, New York, pp. 38,177–179. Johanson and Edgar, Ref. 29, p. 177.